Home > Nutrition > Quinoa, a Super Food! Till recently, quinoa (keen wa) was a little known seed. It has, however, gained popularity since it's very delicious tasting as well as having several major health benefits. You can get quinoa in your local health food or grocery store throughout the year. Quinoa is very high in protein. And one of few vegetarian sources that are "complete protein", meaning it has all nine types of amino acids humans need on a daily basis. Not only that, it's also a great source of magnesium, iron, copper and phosphorus. And it's extremely antioxidant; therefore very much beneficial for someone suffering diabetes, migrain and any type of cardiovascular disease and almost all other health problems. Quinoa helps tremendously with all menopause symptoms. It's also essential to fight acid reflux and IBS. All three conditions that have become more prevalent. Here is a healthy meal that is free of gluten, moderate on the glycemic index, and top-notch for heart health while not offending weary, acid-burned tummies. I hope you'll give the quinoa a chance. It's really pretty good. You can use plain, organic quinoa and cook it in 1 ¼ cup of chicken stock and add a teaspoon each of dehydrated garlic and red onion. As there is sodium in the stock, you don't need to add extra salt. While that is cooking on the stovetop, heat the oven to broil the perch. Normally, for diabetics cooking temperatures are not generally something you want that high, but when you are only broiling a piece of fish for 3 minutes on each side you can get away with it. Let it marinate in 1 tablespoon of lime juice and 1 tablespoon olive oil for a few minutes before popping it in the oven. Sprinkle it with a bit of crushed black pepper, too. As the oven heats and the quinoa cooks, grab about a cup of shredded carrots and began to sauté them with a splash (less than a half tablespoon) of teriyaki sauce and a tablespoon of olive oil. If you like your carrots with a little crunch to them, don't let them cook for more than about 5 minutes. The salt from the teriyaki sauce was plenty to cut the fishy taste of the perch (if you don't really like fish) and add some tangy sweet of a raw green apple to garnish. That is a really nice, crunchy compliment. The package directions explain that after about 12 minutes of simmering the quinoa, remove it from heat and let it set for a few minutes before fluffing with a fork. Instead, you can mix ¼ cup of cold water with 1 teaspoon of potato starch and mixed in with the broth/quinoa dish and let it cook for about 5 more minutes. This is a gluten-free way of thickening broth that won't add a ton of calories. 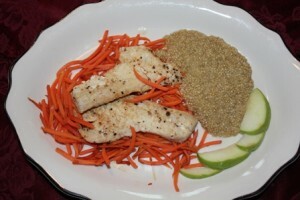 It gives the quinoa dish a creamy, smooth moistness that makes it really tasty. Right before the potato starch step, put the perch in the oven, since it only takes about 6 minutes total to cook. The photo shows what you end up with after plating, and it's enough for 2 people since perch is really filling, especially when you pair it with hearty, creamy quinoa. The time commitment for preparing this meal, from the time you start dragging stuff out of the fridge to the time you sit down to eat is less than 30 minutes. Carbohydrates: 80 grams (for diabetics, changing out the apple and carrots for other fruits/veggies will help drop the total carb count).